← Random Panel: Stranger danger! I am happy to announce that the winner of Caption Contest 58 and his choice of either his face or a custom item to be included in HeroMachine 3 is ... FishPants! TheNate: "Gas cloud near my head? Only a blundering fool would miss that." I think they both did the best job of incorporating Mystery Ninja's line in a way that was funny and not so forced. 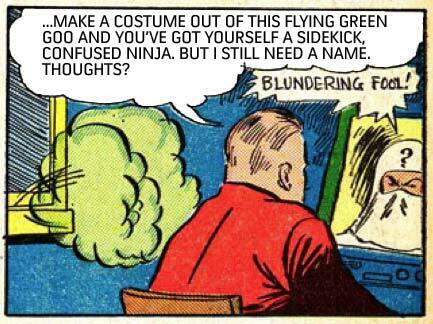 Ultimately, I went with FishPants because he had a higher joke density -- "Confused Ninja" makes me laugh as much as the idea of this guy calling himself "Blundering Fool", possibly the greatest sidekick name ever. Michael: No worries sir he’s my new sidekick, Gassy. Patrick: What makes you think I ate the kryptonite laced bean dip meant for Superman? Whit: Nothing to worry about, boss. The Phantom Broccoli HATES the colour red! 7 Responses to Caption Contest 58 Winner! Woohoo! Thanks! Yeah I tried to come up with some other reasons for him to say Blundering Fool. I wanted to do something like “Dude! Blundering Fool is opening for Bon Jovi! Woooooooooooooo!” Wouldn’t have explained the question mark or the green cloud though. You guys are hilarious as always. The Phantom Broccoli was my personal fave. I thought Phantom Broccoli was brilliant as well.